Building community on your website is a must nowadays. Outside of traditional comments, you can accomplish this by building a social network. And one great way to do that is to create a forum. I’ve written before about how to add a forum to your WordPress site. Those forums were brand new and were installed into WordPress as they were born. What about a forum that was born outside of WordPress? Forums have been around for a long, long, time. They’re one of the oldest platforms on the Internet. In fact, the phpBB platform has been around since 1994. Another popular forum platform is vBulletin, which has been around since 2000. This means that there are a lot of them that have been in use for longer than WordPress has been in existence. What if you want to integrate one of these old forums that has dozens, thousands, or even many millions of users and comments—or any existing forum for that matter—into WordPress? Okay, let’s back up a minute. First, what do I mean by integration? I don’t mean connecting them together with a link that takes the visitor from your WordPress site to the forum site. I mean actually bringing the forum into WordPress so that it’s truly integrated. If the two platforms only contain links from one to the other, the users will have to sign in to both independently. And, they will have to go to each platform independently to see updates. That’s not integration. Integration merges them together so they act as one. Once the two platforms are completely integrated, users will only have to sign in once. It doesn’t matter which platform they sign into; once they’ve signed in to one they’re signed into the other. And, no matter which platform they’re looking at, they will be able to see updates to the forum because they will act as a single platform. Now, I know this sounds daunting, but please don’t be afraid. If you can create and admin a forum or run a WordPress site you can do this. In fact, if you’re a forum admin you’re already doing the impressive and scary part. So let’s get started. Some integrations are as simple as installing a plugin. Others—not so much. One problem is the sheer amount of forum platforms out there; and not all of them have easy solutions. The most WordPress friendly forum platform is phpBB. There are many good plugins available to integrate phpBB into WordPress. The platform is widely used and established. The following list are bridges that connect the two platforms for a completely integrated solution. 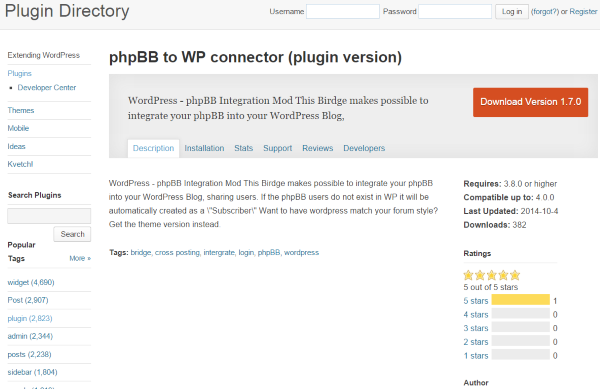 phpBB to WP connector is a plugin that connects your phpBB forum to your WordPress site. It shares users with WordPress. Users that do not exist in WordPress are automatically created as a WordPress subscriber. It allows users to use PHP login credentials to comment, so it doesn’t require new credentials for current users. User integration. This includes a single sign-on, it synchronizes profiles with avatars, and includes user management. You can use external registration modules such as plugins for social media logins. It automatically creates user accounts between phpBB and WordPress. And you can easily set individual permissions. Template integration. Your phpBB forum appears within your WordPress site, or your WordPress site can appear within your phpBB forum’s header and footer. It analyzes your CSS and makes the necessary modifications to avoid CSS and HTML conflicts. It does not use iFrames. Behavior integration. This gives you word-censor features and allows you to use phpBB smilies. Cross posting. You can have it automatically—or manually if you choose—to crosspost between WordPress and your forum. It will even sync comments. WP-United also includes 10 widgets that displays information about the forum. They are configurable and even work with the other modules turned off. These widgets include latest posts, latest topics, current users online, statistics, an integrated login/meta/avatar/profile block, birthday list, quick poll, useful links, top bar with breadcrumbs, and a bottom bar that matches top bar. 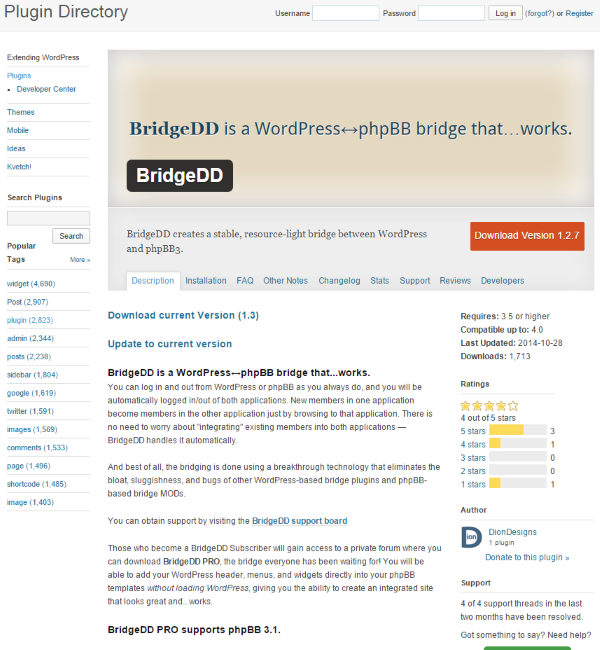 BridgeDD is a WordPress bridge that doesn’t bloat or slow down your WordPress site. It automatically handles integrating members between both applications. This plugin is free to use. For even more features you can subscribe for $40 per year. 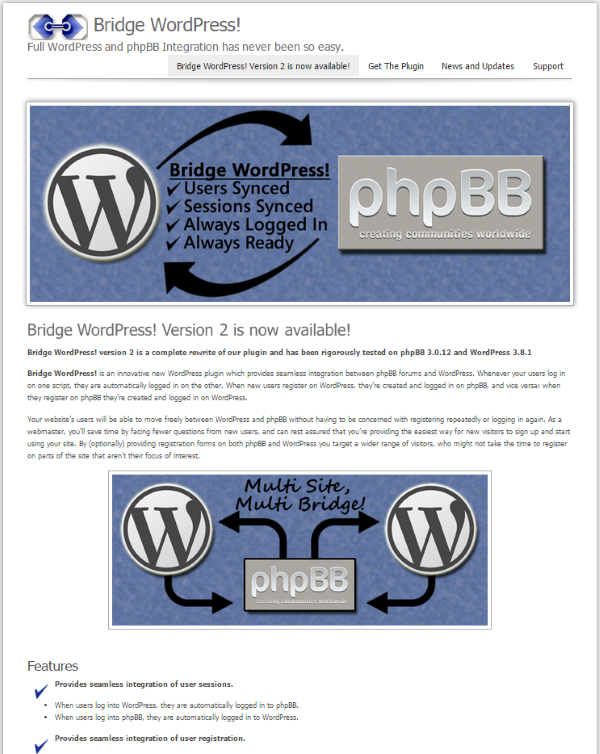 This gets you access to BridgeDD PRO, which allows you to add your WordPress header, footer, and widgets directly into your phpBB templates. It does this without having to load WordPress and it creates a seamless integration. The subscription also includes supporting CSS, custom plugins, and phpBB modifications. Bridge WordPress! 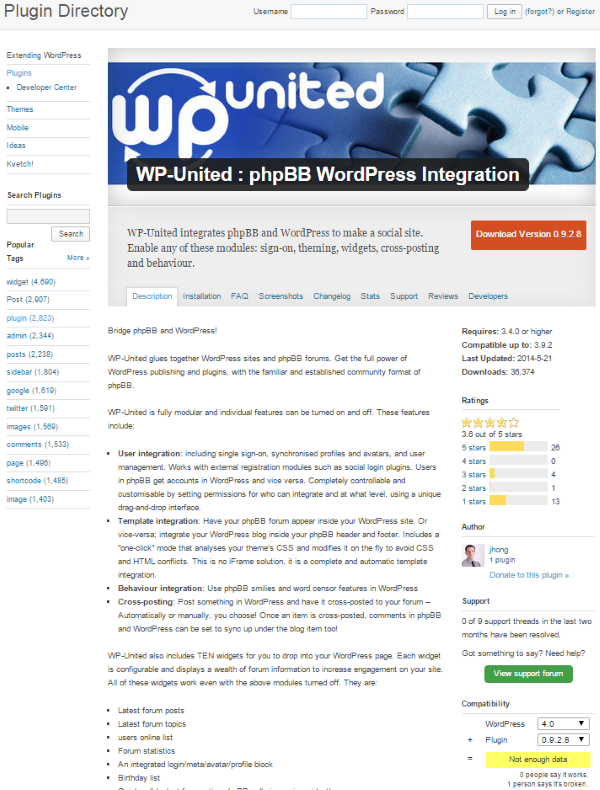 Is another WordPress plugin that was developed for seamless integration between WordPress and phpBB. When users register in one they are automatically registered in the other. Likewise, when users are logged into one they are automatically logged into the other. This allows users to move from one to the other without having to log into each independently. Users can register on either platform. If they update their password and email address on one platform, the info is updated on the other. Installing it is easy but it does require some PHP code changes. Well, not really “changes,” just the addition of a single line of code. Once you’ve installed the plugin in WordPress you go to the phpBB side and add a single line of code. You then enter your settings on your dashboard and you’re done. Integrated. It also works with WordPress Multisite. Speaking of, the coolest thing about this plugin is its multisite feature. It will connect multiple WordPress sites to the same forum. Bridge WordPress! also works alongside the Domain Mapping plugin so forum members can have separate blogs. This is a premium plugin at $29.95. Another popular forum platform is vBulletin. This one is a premium platform. There are not as many integration solutions but there are a few that work really well. 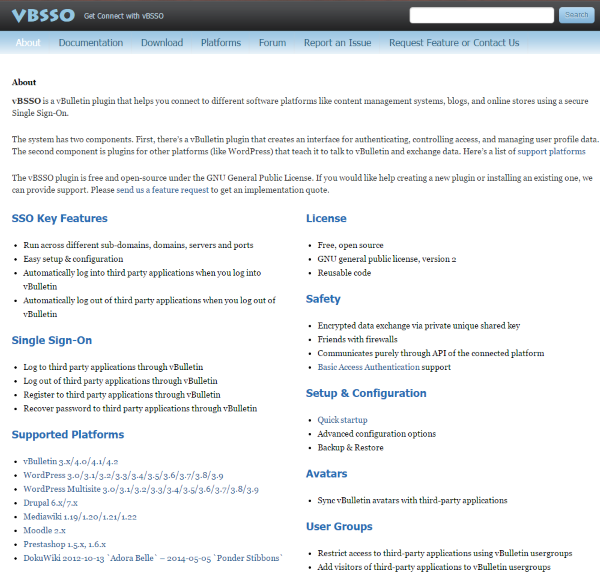 vBSSO is a free open source plugin for vBulletin that connects your forum to various other platforms including WordPress. It has two components: one for your vBulletin forum and one for your WordPress site. The vBulletin component creates an interface for authenticating, controlling access, and managing user profile data. The WordPress component creates the interface that allows vBulletin to share data with WordPress. vBSSO has strong safety features. Data is exchanged using a private security key and it communicates only through the API of the connected platform. It also includes Basic Access Authentication support. You can log in and out of third party applications through vBulletin using a single sign-on. 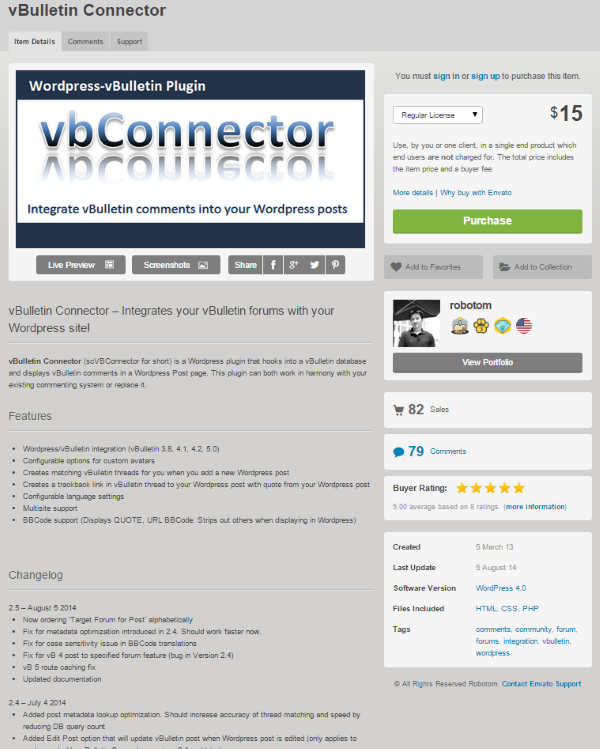 vBulletin Connector is a WordPress plugin from CodeCanyon. It connects to your vBulletin database to display comments in WordPress posts. It can be used with your existing commenting system or it can replace it completely. It creates a matching vBulletin thread when you post in WordPress and creates a trackback link in the vBulletin thread back to the WordPress post. The vBulletin post contains a quote from the WordPress post. The posts are placed in forum categories that you choose. There are customization options for avatars, configurable language settings, and multisite support. It also has BBCode support so it will display QUOTE and URL BBCode. One downside to this one is that is doesn’t do login and registration syncing. So a new user in vBulletin isn’t automatically created in WordPress. This is a premium plugin with two purchase options. The first is the regular license. It is for use in a single product and costs $15. It can be used by a client but the end user is not to be charged for it. The second is the extended license. It is for a single product and costs $75. It is for a single product in which the end user can be charged for it. For some forum platforms there are no currently supported WordPress plugins available. One option is to import your forum data into another platform for use with WordPress. There are a few different options to do this. bbPress, from the makers of WordPress, allows you to import forum posts from other platforms such as Simple Machines Forum. It also works with many others including vBulletin. It adds several options to your dashboard for creating and managing a forum. It fully integrates into your site and you can manage forum topics and replies easily with several included widgets. Visitors can subscribe to the forum itself, to specific topics, and to replies. You can set user permissions individually so they can delete posts, make stickies, flag spam, make edits, and more. Importing your forum data is simple. You will have to configure the importer, but there are step-by-step instructions on how to do it. Detailed instructions are also given so you can create your own custom importer if your platform is not on the list. 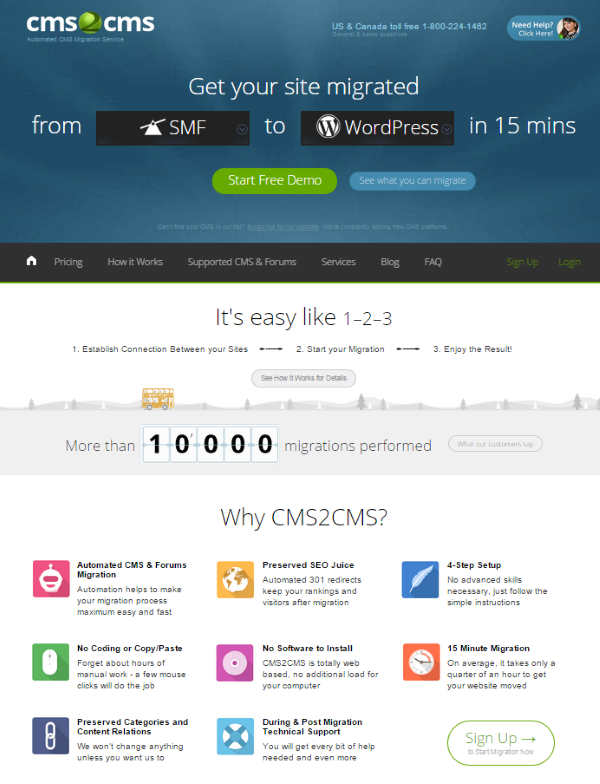 CMS2CMS is a service that will migrate from one content management system to another. 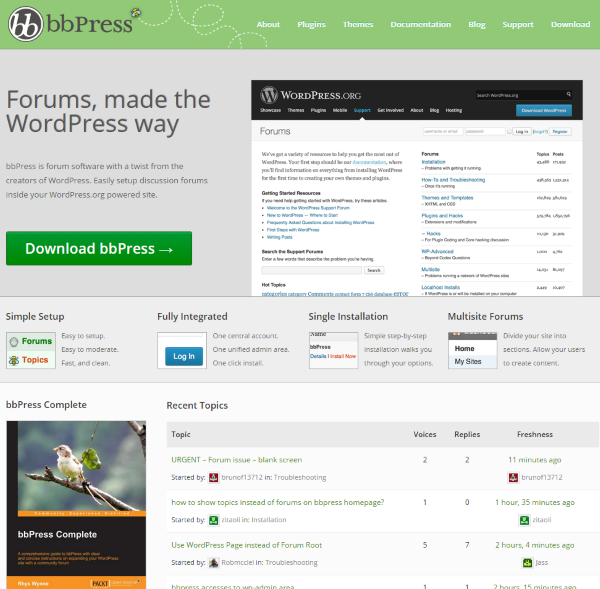 It is a great way to migrate your forum to bbPress or WordPress. The migration is done through their website so there’s no coding or software installation on your part. It preserves your SEO rankings and visitors, and it keeps your category and content relations. Supported forum platforms include vBulletin, myBB, Board, phpBB, Joomla Kunena, Simple Machines Forum, Drupal Forum, ImpressCMS, Simple:Press, and Tiki Wiki CMS. Migration from one platform to another takes 15 minutes. CMS2CMS will migrate content, users, categories, images, tags, comments, etc., from your old forum to your desired forum. You can try a 10-page demo to see if it will work for you before you move everything over to your new system. For pricing, there is an easy to use price estimating app on their website as well. It allows you to choose the platform you’re moving from, the platform you’re moving to, and the number of threads, users, and posts. I used the default settings for an estimate to move an SMF forum to WordPress. The default settings were 250 threads, 1000 users, and 1000 posts. I then checked the additional options, which gave me three choices (the rest were grayed out): 1, clear current data on new site before migration (free); 2, migrate images / attachments ($1.00); 3, fix broken relationships in the database (free). I chose all three options. My estimated migration price was $50. I doubled the number of threads, users, and posts and the estimated migration price was $78. I doubled them again and the estimated price was $98. So for under $100 I could migrate an SMF forum with 1000 threads, 4000 users, and 4000 posts to WordPress. vBulletin was $49, $77, and $97, but migrating images / attachments wasn’t an option. If you don’t want to migrate your forum to WordPress, and you REALLY want to integrate your forum with WordPress like one of the phpBB options, you can always migrate your forum to phpBB and then integrate the two platforms. FYI: the prices to migrate from SMF and vBulletin to phpBB were the same as migrating them to WordPress. Adding an existing forum to your WordPress site shouldn’t be complicated. In fact, it’s downright easy if you use the right tools. And there are plenty of tools out there to get you started. Hopefully, this list gets you set out on the right track. But before you start your integrating, importing, or migrating, I want to hear from you. Do you use any of these plugins or services? What’s your experience with it been like? Or, do you use a different solution that I missed here? As always, I’d love to hear your thoughts in the comments! The post How To Integrate An Existing Forum Into WordPress appeared first on Elegant Themes Blog.